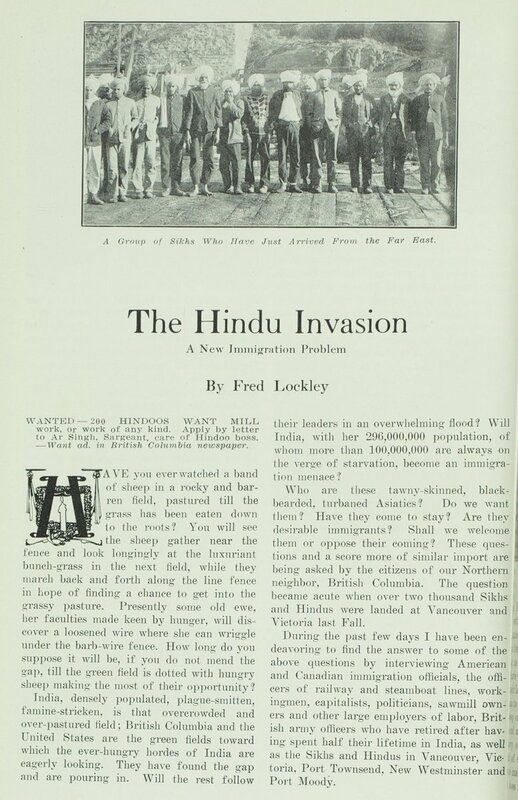 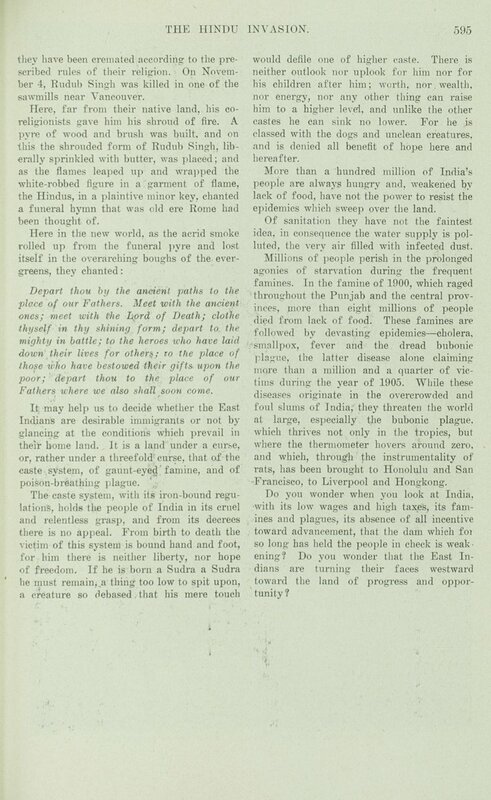 An article written by the prominent Oregonian journalist Fred Lockley from the May 1907 issue of Pacific Monthly on the threat of "Hindu Invasion" in America and Canada. 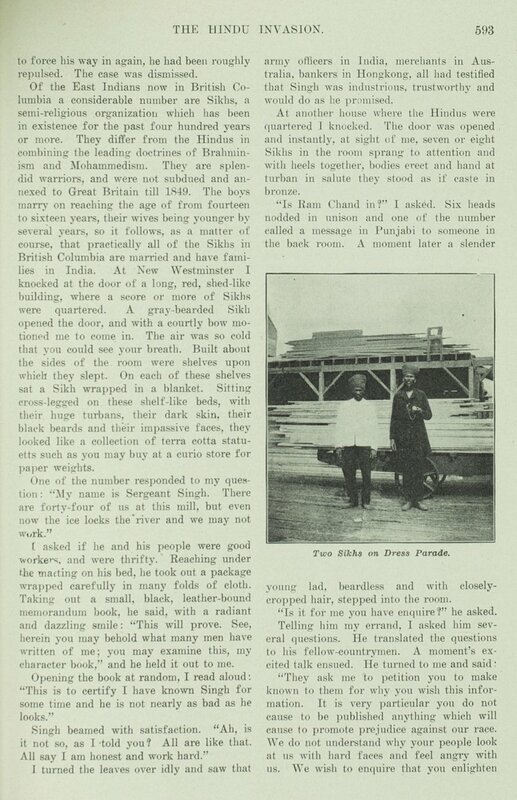 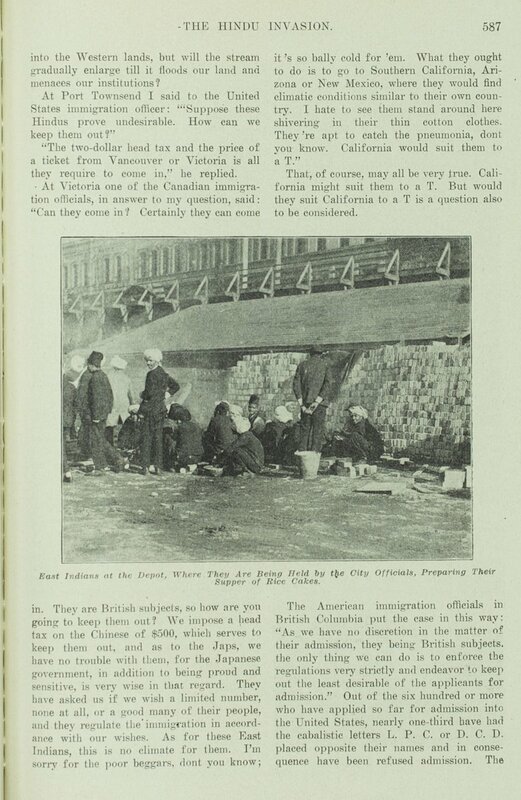 Throughout the article, Lockley interviews several vested interests in the question of East Indian immigration to British Columbia and the Pacific Coast of the U.S, including quotes from Canadian and American customs officials, city officials, as well as the South Asian laborers, themselves. 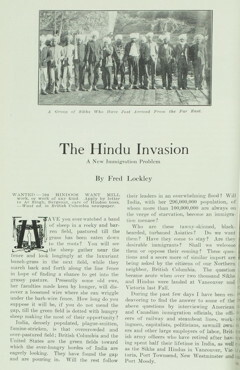 Lockley cites that one-third of the Sikhs who applied for admission to the U.S are being refused, for three reasons: being labeled L.P.C. 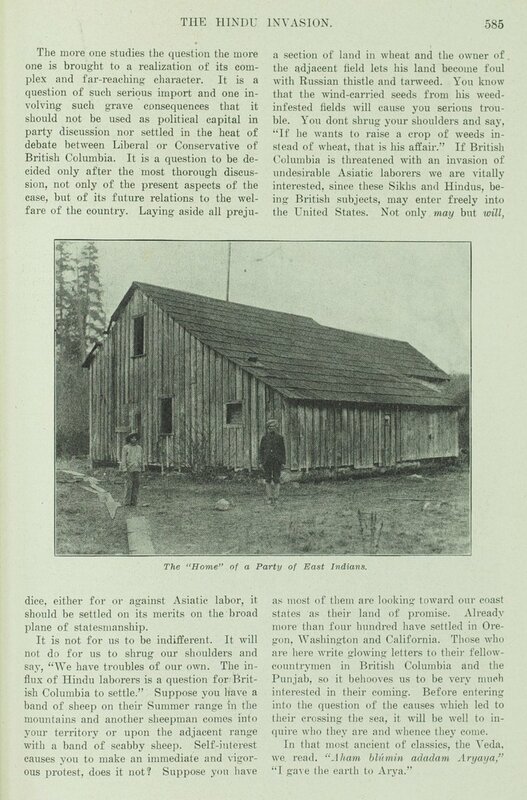 (Liable to becoming a public charge), D.C.D. 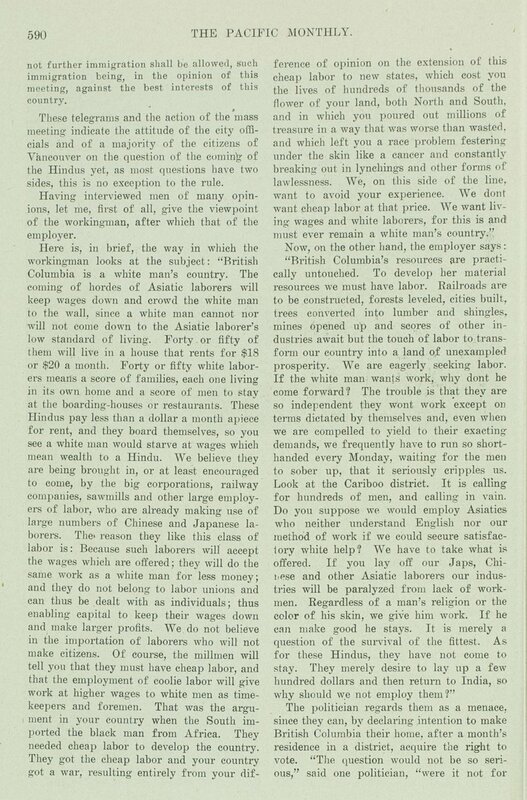 (a carrier of a dangerous contagious disease), or violating the alien contract-labor law. 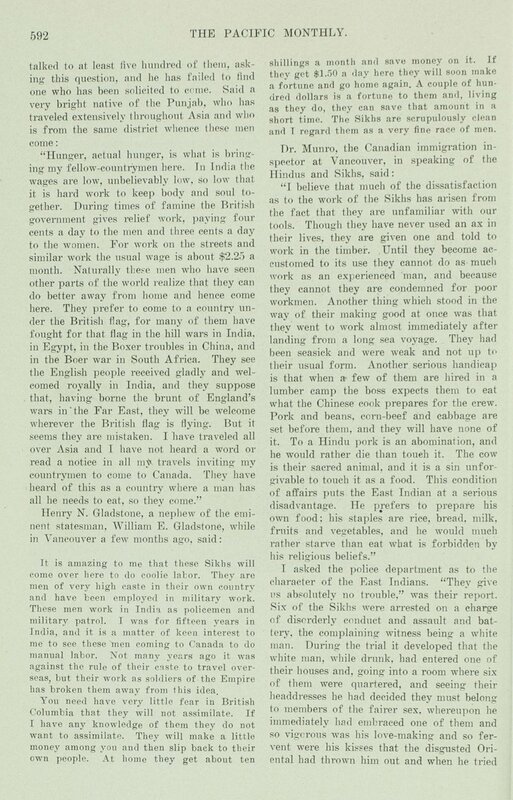 Lockley goes into considerable detail about an incident involving East Indian passengers of the Empress of Japan ship, who were detained in a detention shed upon arrival to Vancouver, on the order of the mayor of the city. 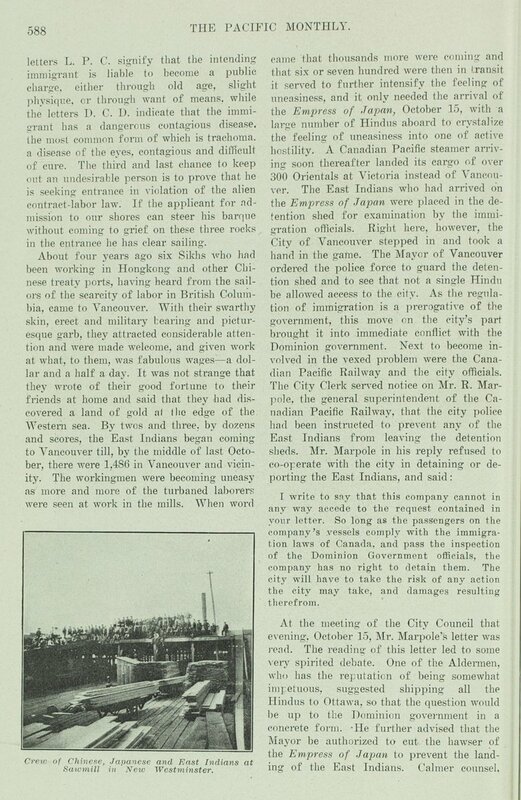 During a subsequent city council meeting, one Alderman suggested shipping the detained East Indians to Ottawa, so that the Dominion government could make a decision "in concrete form." 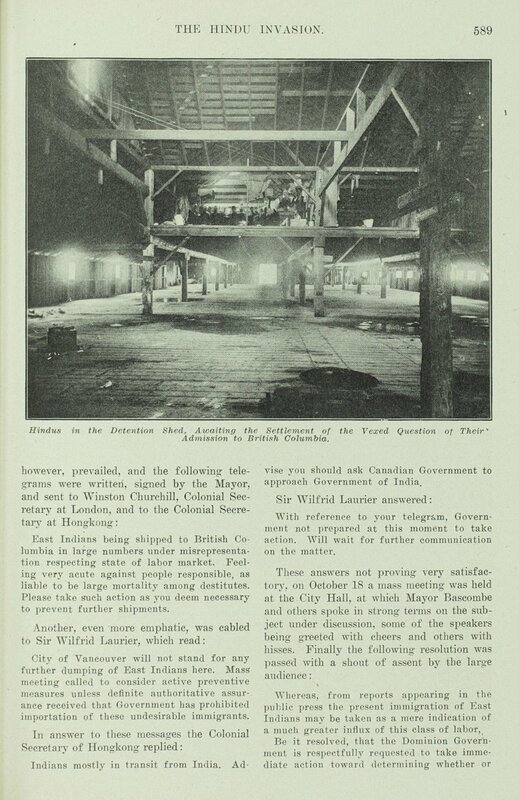 The article contains several citations of appeals from the Mayor to the British colonial government. 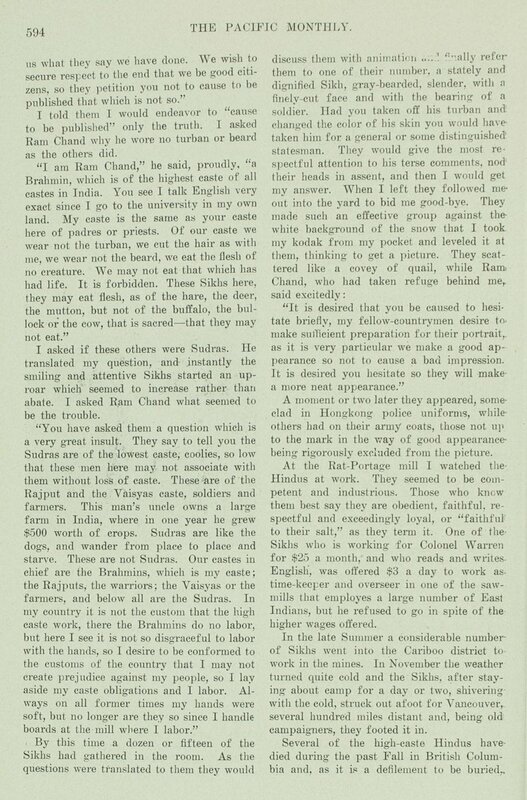 Lockley also includes quotes from Sergeant Singh, a Sikh, and Ram Chand, a Brahmin -- two of the East Indians Lockley interviewed about their living quarters, work habits, and cultural practices -- before ending with a discussion of India's three-fold curse: the caste system, famine, and the plague. 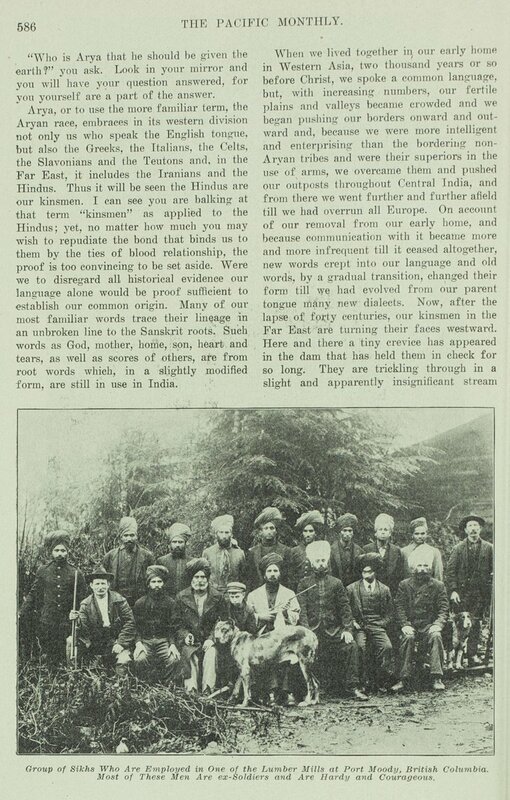 Includes eight unique photographs of the East Indian laborers, captioned as follows: "A Group of Sikhs Who Have Just Arrived From the Far East," "The 'Home' of a Party of East Indians," "Groups of Sikhs Who Are Employed in One of the Lumber Mills at Port Moody, British Columbia," "East Indians at the Depot, Where They Are Being Held by the City Officials," "Crew of Chinese, Japanese and East Indians at Sawmill in New Westminster," "Hindus in the Detention Shed, Awaiting the Settlement of the Vexed Question of Their Admission to British Columbia," "Sikhs and Hindus Who Are Employed in the Mills," "Two Sikhs on Dress Parade."